People often ask me if I miss living in Canada. I’ve been living in Ireland now for almost five years. I have three great kids, a house we’re fixing up, a big garden (and more gardens planned), a small business and lots of friends and family milling around. So yeah, it’s safe to say I’m usually too busy to be feeling homesick for Canada. That said, I recently got my kids their Canadian citizenship and, this year being Canada’s 150th birthday (if you’re First Nations, though, I should add that Canada is thousands of years older), I started feeling a bit nostalgic with all the celebrations and activities posted all over my social media streams. Canada Day is July 1st, so it’s already happened. I didn’t do anything on the day to celebrate. Sometimes I host barbecues, bake a cake and have my friends over for Canada Day, but this year – having just had a baby – I wasn’t really feeling it. Too much, too soon. Lobster season: May to July in Cape Breton. Lobsters everywhere you look. Lobster boil dinners at every small community hall. Lobsters being sold right from the boat. I love lobster, and I really miss eating it when it’s at its best. That also goes for mussels, scallops, haddock, salmon, chowder… and the list goes on. I know Ireland is surrounded by ocean, but there isn’t great seafood in landlocked Tipperary! The beach: Cape Breton has so many gorgeous beaches. By July the water is warm enough to swim, the sand is golden and fine-textured and the beaches are relatively isolated. I love Irish beaches, but find the water is usually a bit too cold and most beaches a bit too crowded. The restaurants: I love lobster and seafood. I love the places that prepare these foods as well. The Rusty Anchor in Pleasant Bay (where I once had some decadent lobster poutine with a cold beer; one of my most favourite meals), The Dancing Goat in Margaree, The Herring Choker in Nyanza, Charlene’s Bayside in Whycocomagh, The Bite House in Big Baddeck – all of these places make amazing Cape Breton food and deserve all of the accolades. I miss these places. My friends and family: Obvs. I love and miss my *very large* extended family. Aunties, uncles, cousins, nieces, nephew, brothers – I miss them all. The weather: in summer, it’s warm enough to swim in the river and in the ocean almost every day. On the East Coast, though, it’s not as hot as it would be elsewhere in Canada. We have the ocean to keep the temperature moderate (like, 35°C and under). A great deal warmer and sunnier than an Irish summer, but still comfortable (I don’t miss black flies and mosquitos, though). Wild Blueberries and good Maple Syrup: I miss these things very much. The fruit in Ireland is lovely, but the blueberries here don’t compare to the blueberries in Cape Breton. Canadian beer and wine: in Nova Scotia there is a wine appellation called Tidal Bay. It’s located close to where I went to university. The wine is gorgeous. Once, a sparkling wine called (Benjamin Bridge) Nova 7 beat out actual, expensive champagne at a tasting I attented in Toronto. It’s that good. The beer in Ireland is great, so I don’t miss Canadian beer that much; just certain kinds. Homestyle baking: I know I do a lot of Cape Breton-style baking here in Ireland, but I miss other people’s baking. Namely from the cafes I mentioned previously, my aunties and older people from around my community. 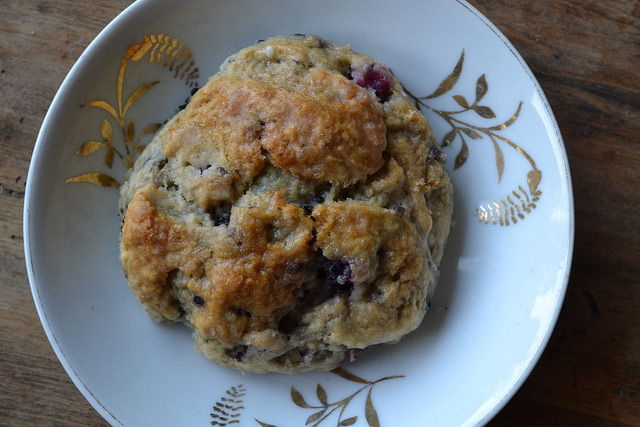 Speaking of homestyle baking, I especially love East Coast scones. Large, triangular, sweet with a crunchy sugar or glazed topping, scones in Cape Breton are indulgent – often made for sharing – and perfect with a cup of strong tea. I whipped up these maple walnut scones with another nostalgic food in mind – ice cream! I love the ice cream at home. It’s not soft serve like a 99 here in Ireland, it’s hard and comes in a million and a half flavours; one of my favourites being maple walnut. 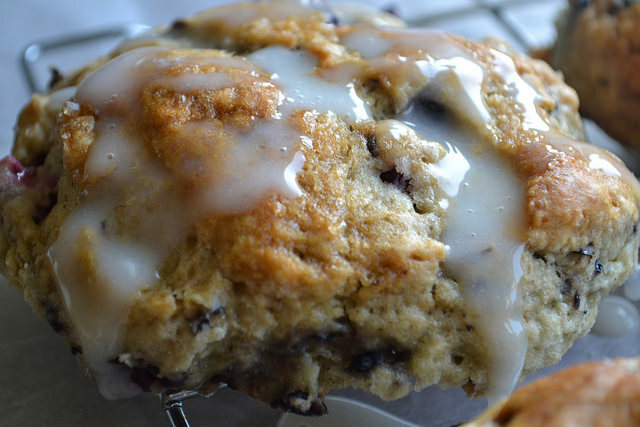 No need for butter and jam on these scones. The glaze is thick enough to ensure the right amount of sweetness in each bite, and the walnuts are toasted in the oven and then soaked in maple syrup. Perhaps most importantly, the flavour is nostalgic enough to get me through to my next visit home. Preheat your oven to 200°C (400°F). Line one or two baking sheets with parchment and set aside. In a large bowl, combine the flour, baking powder, salt, brown sugar and cold, cubed butter. Using a pastry cutter or your fingers, cut/rub the butter into the dry ingredients until the mixture resembles coarse crumbs. Make a well in the centre of the butter/dry ingredient mixture. In a large measuring cup, measure out the buttermilk, then add the egg and vanilla. Mix to combine. Add the wet ingredients to the well in the middle of the dry ingredients. Using a wooden spoon or just using your hands (your best pastry tool!) mix the wet into the dry until just combined (mixture should be on the wet side – if it’s dry and crumbly add more buttermilk!). On a lightly floured surface, turn the dough out and knead lightly for one minute. Form into a ball and allow to rest for 10 minutes. Using more flour for dusting and a rolling pin, roll the dough out into a thick rectangle (you want to get 8-10 scones out of this dough at most). At least 1.5 inches thick. Cut the rectangle into 8-10 smaller rectangles or triangles. Transfer to the prepared baking sheets. Using a pastry brush, lightly brush the tops with milk and sprinkle a bit of sugar over each scone. 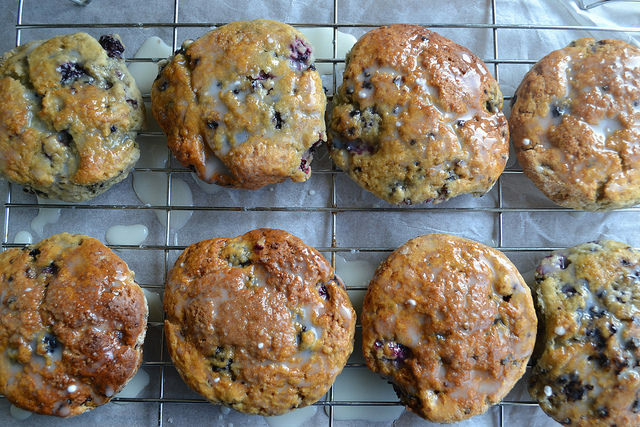 Bake the scones for 20-ish minutes. Let cool slightly on a rack. Make the glaze: in a mixing bowl, combine the icing sugar, maple syrup, maple extract (or vanilla) and about a tablespoon of heavy cream. You want the glaze to be thick, but still be able to drizzle it over the scones. If the glaze is too thick for your liking, loosen it up with a bit more cream. Dunk the tops of each scone in the glaze, or spoon the glaze over each scone allowing the excess to drip down the sides. Top with toasted maple walnuts. Allow glaze to set slightly before eating (if you can wait that long). 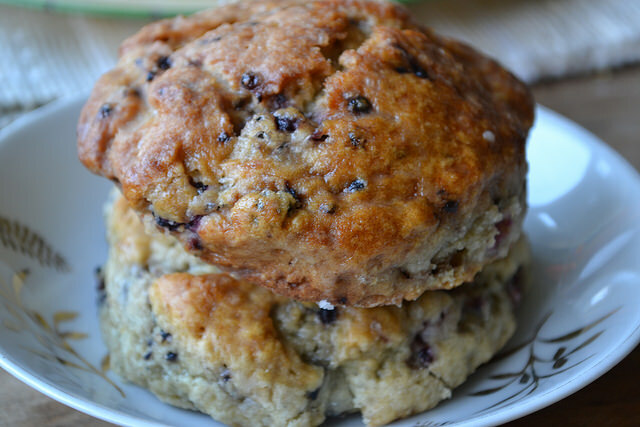 The scones will keep no longer than two days, so make sure you eat them right away! I’m back home. In Ireland, I mean. It’s funny, I call Cape Breton “home” and Ireland “home”, but when I talk about Cape Breton being home it’s meant to be past tense. As in, it used to be home and will always and forever more be referred to as home. But, as wonderful as Cape Breton was, and Vancouver, and Victoria, it is so, so good to be back in Tipperary. And it’s summer. My garden is growing. There are baby animals everywhere (and thanks to my cat, baby animal corpses everywhere, but we won’t go there right now) and, even though it’s often grey and rainy, it’s sometimes warm and sunny. Already much better than last summer, which was mostly cold, windy and rainy. I’ve been home a little less than a month and I’m already super busy. Making plans, going to playdates, taking little day trips here and there, visiting, baking. The bit I’m most excited about is the plan-making, but I’m not ready to say anything more about it at the moment – just stay tuned! Also, once again, this little blog has been long-listed for two Littlewood’s Ireland Blog Awards, which is really, really lovely! I’m also up for a Huawei Snapy Instagram Award! If you feel so inclined, you can check out my entry (and possibly give it a vote) here. So yes; I’m super busy. But don’t worry, I always have my two darling children to keep my ego in check. Whether it’s by peeing on the floor (daily) or simply staying up all night long, my kids continually remind me who’s truly in charge of my life (or I guess you could say: what’s truly important in life). I wouldn’t have it any other way, really. When I came home, my garden was so overgrown with weeds it looked more like a jungle. It took four solid evenings of weed-pulling and seed planting, but my hard work is paying off. Napa Cabbage (for autumn kimchi making! ), sprouting broccoli, cauliflower, squash, pumpkin, courgette – you name it, it’s been planted and is currently sprouting. I was late getting a few things planted, but the growing season is longer here than it is in Canada so I’m keeping my fingers crossed for a good harvest. Two things that were ready when I got home were our strawberries and rhubarb. I’ve never grown strawberries before, but this year Maeve asked if she could plant them. Our old farmhouse is surrounded by very old, black cauldrons (I think they were used for laundry or something back in the day) so we found the biggest one and planted the strawberries there. We left tiny seedlings and came home to a huge, vine-laden bunch of plants just dripping with beautiful berries. This is a great summer cake to make with whatever fresh fruit or berries you have on hand. I made it with our gorgeous strawberries (of course) and fresh rhubarb, but it would be great with blueberries (with some maple syrup and lemon), peaches, plums or cherries. The cake base is a super-moist hot milk cake recipe that I use all the time – it never, ever fails me. Preheat the oven to 350∘F (190∘C, no fan). Grease a round springform pan and place the pan on a lined cookie sheet (in case it leaks) set aside. In a small saucepan, combine the butter and brown sugar for the topping. Bring to a boil and remove from heat.Pour the mixture into the bottom of the pan and arrange the strawberries and rhubarb over the top. Set the pan aside again and make the cake batter. To make the cake: whisk the eggs, vanilla and sugar until pale yellow in colour and nearly doubled in volume (this is known as the ribbon stage – the mixture should drip off the whisk in ribbons). Add the flour, baking powder and salt to the mixture and stir until just combined. Add the hot milk all at once and, again, stir until just combined and there aren’t any lumps in the batter. Gently pour the cake batter over the strawberries and rhubarb in the springform pan. Bake in the preheated oven for 30-35 minutes (if you have an extra-hot oven start checking your cake at 25 minutes). A skewer inserted in the centre of the cake should come out clean. When the cake is ready, allow to set in the pan for 15-20 minutes, then run a knife around the edges and gently remove from the pan. Flip the cake onto a plate and gently lift the bottom of the springform pan. Voila! You should have a perfect upside-down cake. I’ve been in Canada for a little over a week now. The jetlag is gone, the sun is shining (though the temperature is nothing like the balmy weather the Irish are enjoying) and I’m busy catching up with family and friends I haven’t seen since 2014. If my husband were here with me, things would be perfect. He’s not, though, so things are just very good. We’ve been spending a lot of time outdoors since the sun’s been shining. There’s a large pond behind my parents’ house and Maeve likes going down there to see if there are any frogs (though she doesn’t like to get too close to the water for fear of falling in). We’ve been looking under big rocks and logs for bugs, wiggly worms and the many cute little salamanders who call the backyard their home. Last weekend was Canadian Mother’s Day (we celebrate in March in Ireland) and as we spent the day spoiling all the moms and mom-types in our lives, I couldn’t help think about my sweet Grandma, who lived with me and my family until she passed away over 15 years ago. Aside from my mother, who taught me that you can work full time, be a great mom, have a social life and be involved in your community, my Grandma was the most important woman in my life. She suffered from MS and was confined to a wheelchair, but that didn’t hold her back. She was a sweet, strong, soft-spoken woman. She was also a great baker. This Baked Chocolate Pudding is one of my favourite “Grammie” desserts. Served hot with fresh cream or ice cream, it’s pure bliss. Velvety chocolate sauce with soft, rich cakey bits – what’s not to like? If you’re having people over for dinner, you can put it in the oven just before you’re ready to sit down to eat. It will be molten hot – the perfect vessel for something cold and creamy dolloped over top. *My plan was to lose as much baby weight as possible while home for the next 1.5 months. I realize now this probably isn’t going to happen. Stay tuned for more delicious Cape Breton adventures! Preheat the oven to 350∘F (180∘C). Sift all of the dry ingredients into a mixing bowl. Stir the hot coffee and melted butter together. Add the buttermilk/vanilla to the dry ingredients, then the coffee/butter mixture. Mix the batter until everything is *just* combined (don’t overmix). Pour the batter into an ungreased pie dish or small casserole dish and spread evenly on the pan. Mix the hot coffee, boiling water and vanilla and set aside. Mix the cocoa and brown sugar and sprinkle evenly over the top of the batter. Pour the hot water/coffee mixture evenly over top. Place the pie/casserole dish on a sheet pan (in case it overflows) and bake in the preheated oven for 45 minutes. Allow to cool 10-15 minutes, then serve hot with ice cream or whipped cream. Not that it’s been very autumn-ey here in Tipperary. When I got off the plane in Dublin a month ago I was prepared with a warm sweater and my rain jacket handy, but as it turned out I didn’t need them… and I haven’t needed them all month. See, the very first time I came to Ireland was in September. I left Korea with Pat and we were going to settle in Toronto for a few years, but we wanted to come here to visit with his family for awhile. So while my two cats flew straight to Toronto to be picked up and cared for by two saintly friends, Pat and I flew to Ireland for a month. When we left Korea, it was normal Korea-weather for September. Hot. Still hot. Muggy. So muggy. I had been getting Japanese straightening perms my entire time in Asia but still, my hair was no match for a long Korean summer. Imagine my genuine shock when we landed in Dublin late on that September evening, coming from the hot, sunny weather in Korea and descending into the bone-chillingly cold Irish autumn. I got used to it quickly, and in fairness, it wasn’t bone-chillingly cold our entire time in Ireland (there was a particularly beautiful warm, sunny day spent on the lakes of Killarney). When we arrived in Toronto later that October I wasn’t so shocked by the cold weather. With the unseasonable warmth this year came a shitload (an actual technical kitchen term, folks) of blackberries. I don’t know if I mentioned this already, but Pat and I are fixing up the family farmhouse in Tipperary, meaning we’re not in Waterford anymore (sniffle). 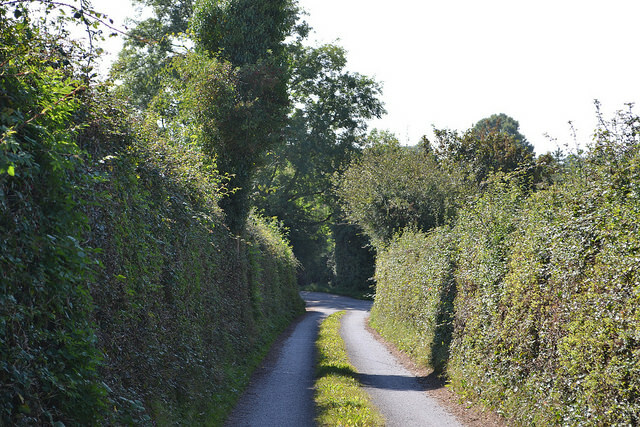 We live down a long dirt road lined with hedges. 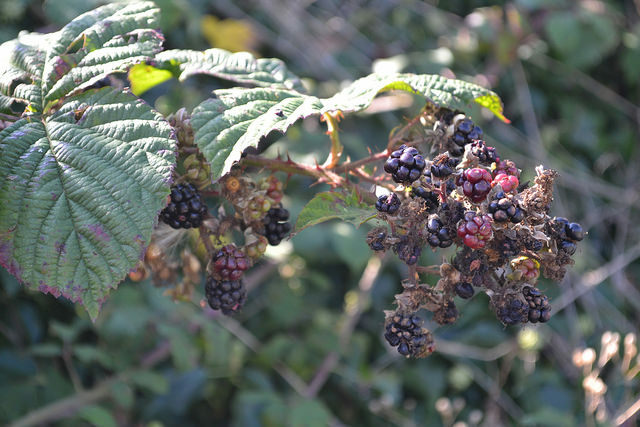 I was delighted to discover the hedges were basically all blackberry bushes, sloe bushes, rosehips and elderberries. Jackpot. I live on a dairy farm now. I can just skim a bit of cream from the batch whenever I want. ENDLESS CREAM, PEOPLE. I had an amazing meal in Cape Breton at The Bite House which ended with a gorgeously plated cream scone crumble. I couldn’t get Bryan’s scone out of my mind. Blackberries are my favourite berry after wild blueberries. I just love the flavour of them, especially picked wild and at their peak. It’s funny, each year I expect them to taste like raspberries (don’t ask me why) and am then pleasantly shocked when I remember how a blackberry is supposed to taste. 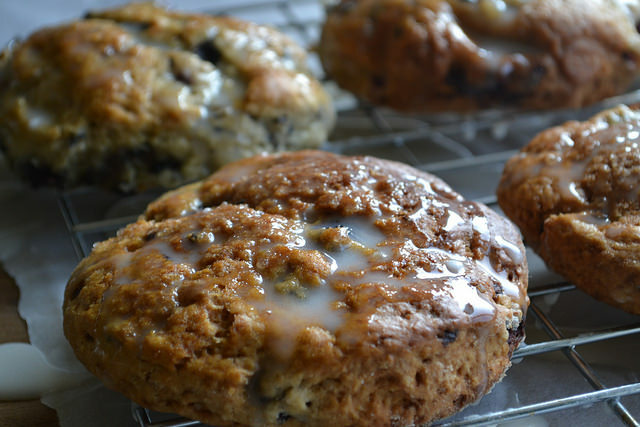 They go so well with these sweet, crumbly scones and go particularly well with cream. You could skip this recipe altogether and just have a bowl of ’em with cream. Preheat the oven to 425 degrees (210 degrees Celsius, no fan) and line one or two baking sheets with parchment. Set aside. In a large bowl, mix the flour, sugar, baking powder and salt. Rub in the cold butter until the mixture resembles coarse crumbs. Add the blackberries to the mixture. In a separate bowl, mix the cream, egg and vanilla. Make a well in the dry ingredients and add the wet all at once. Mix until everything is just incorporated. On a well-floured surface, knead/continue to mix the dough until you have a bit of elasticity (the dough may be on the wet side). Roll out the dough to a thickness of at least an inch. Cut and place each scone on the parchment lined baking sheets. Mix the three ingredients together for the glaze. Using a pastry brush, lightly glaze each scone while they’re still warm.